‘I learned simplicity, learned slowly and with difficulty how unassuming everything is, and became mature enough to put simplicity into words. And this all happened because I was able to meet you, back when the first time I was in danger of surrendering myself to formlessness. And if this danger always finds a way to return and always returns larger and stronger, it is also true that the memory of you grows in me, the awareness of you, and it too keeps strengthening.’ - Rainer Maria Rilke, an excerpt from a letter to Lou Salomé. There’s a restlessness that comes with the middle of the year. July, a month, that, awakens a sense of inherent unease. Her arrival, a swelling beneath of subterranean springs, of blistering and boiling, of overflow. I've never understood why we choose to furnish our wounds. And July, she’s long been licking at mine. The more she continues to lick, to unstitch what was once sewn, and undress the surgical wound, the more vulnerable the flesh comes to her infection. I long for her departure, but she’s thirty-one days of Winter, and I exist, here, wasted and wanton, for the arrival of Summer. July, an abyss of the season. A time so often without skin. 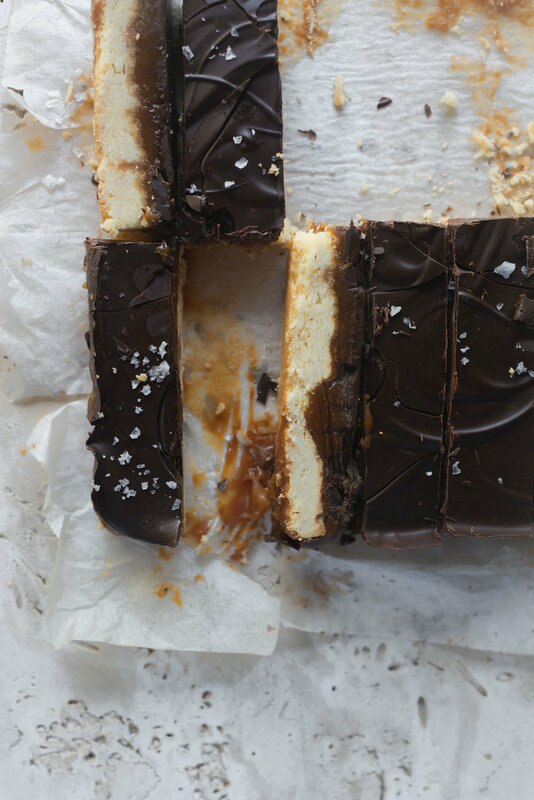 And then there’re these Sea Salt Violet Millionaire’s Shortbread. I promised them a few months ago, and it’s taken this long to bring them to fulfillment, but they’re here. Filled with a sugared layer of crème fraîche caramel fragranced with delicate violet, a buttered shortbread base, and a thick slathering of dark chocolate, they’re heaven. Richly so. A touch of sea salt rounds out their inherent richness and serves to elevate all the boisterous flavors within. A mouthful is ever-so crumbled, sticky-sweet, salty, and creamy, the perfect sugared antidote against the will of the month. Here, I use culinary violet essence. It’s incredibly concentrated, powerfully so, and a little bit does go a very long way. The strength of the essence will differ based upon its brand and constitution, so I suggest using only a tiny drop at the beginning, and adjust as necessary to reach your desired taste preference. For me, I wouldn’t exceed over an eighth of a teaspoon or about three small drops. You want the violet flavor to be delicate and present, not heavily-perfumed and overwhelming. If you can’t source violet essence, it can be substituted with another floral essence, such as rose, orange blossom, or even lavender. I’ve used almond before too. Again, adjust as necessary. And the essence can be omitted all together, if you prefer. Because the chocolate is left unadulterated in this recipe, it should be the very best quality you can find. Use a dark chocolate that you wouldn’t just bake with, but that you would eat. Here, I use Callebaut callets that contain about 60% cocoa solids. The chocolate is dark and smooth, with just the right amount of bitterness. A chocolate with a minimum of 60% is a good amount to aim for here, but you could go a little higher, for something slightly more bitter. I wouldn’t exceed over 75%. And please don’t use milk chocolate, the sweetness of it would overwhelm the entire thing. Pre-heat the oven to 180 Celsius. Line a 20 cm square baking pan with non-stick parchment paper. Let the paper slightly overhang the sides. Set aside. To make the crust, add the flour, sugar, corn flour and salt into the bowl of a stand mixer fitted with the beater attachment. Beat on medium speed for a few seconds to combine the dry ingredients. Set the mixer speed to medium-low and stream in the melted butter. Beat until combined then add in the vanilla bean extract. Continue to beat until the dough is evenly moistened and has begun to roughly come together, a further minute. Stop mixing and tip the mixture into the prepared pan then use your fingers to press the dough into an even and flat layer. Bake until golden brown and just firm, about 20 minutes. Remove from the oven and set aside to cool completely before covering in the caramel. Next, make the caramel. Combine the sugar and water into a medium-sized saucepan set over medium heat. Heat, swirling the pan often but not stirring, until the mixture begins to turn an even amber color. It should reach about 120 Celsius on a candy thermometer. Lower the heat then add in the butter and crème fraiche and whisk to combine. Take caution with this step -the mixture will sputter, steam and foam when the dairy is added but will subside as it continues to cook, so be careful. Let the mixture continue to cook out for a further two minutes undisturbed then remove it from the heat and stir in the vanilla, violet and salt. It should be dark amber in color, thick, and slightly reduced. Immediately pour the caramel over the cooled crust, making sure that it reaches the edges and into an even layer. Set aside at room temperature to cool until the caramel is firm, about an hour. Now, make the topping. Place the chocolate into a medium-sized heatproof bowl set over a saucepan filled with a few inches of barely simmering water. Do not let the bowl touch the water below. Heat, stirring often with a rubber spatula, until the chocolate is melted and smooth. Remove from the heat and use an offset spatula to spread the chocolate into an even layer over the caramel. Place the pan in the refrigerator to chill until the slice is well set, about 2 hours, or overnight. When you’re ready to serve, sprinkle over a little fleur de sel or flaked salt, then use a warm and sharp knife to slice it into even sized bars or squares.